For my first book review I've picked, by accident, a book that is rather tricky to review as it's really a photographic journal of the German 26th Reserve Division - photos that were initially compiled by the divisions Staff Officers in 1920 as a commemorative record of service for veterans of the 26th Reserve Division. So you can imagine text is thin on the ground and heavy on photographs which leaves little for me to analyse or discuss in any real detail. Saying that I've really enjoyed reading it and I'm actually quite pleased I chose it to review as I would never have read it as I normally steer clear of photographic war books. The 26th Reserve Division is a Division I'm rather familiar with. They played a major part on the first day of the Battle of the Somme 1916, defending a portion of the front line trenches and continued to fight through out the Somme offensive. With the 52nd Inf Division on their right flank, their trench line started just north of Beaumont Hamel tracing a line south past Beaucourt, St Pierre Divion on to the infamous Schwaben Redoubt, then on through Thiepval and finally ending just south of Ovillers, where the 28th Reserve Division took over. If you've read any books on the Somme then your bound to have read of their exploits in that particular battle. The German Army on the Somme by Jack Sheldon, and another favourite series of mine The Other side of the Wire Volume 1 and Volume 2 by Ralph Whitehead, cover the Division in great detail, making this book the perfect companion to these highly recommended books. 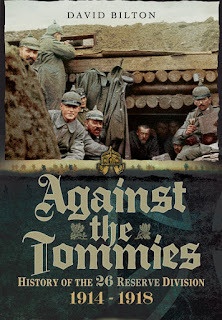 Against the Tommies follows the 26th Reserve Division throughout the War, it starts with them attacking the French in the Vosges, then they were invovled in what became known as the "Race to the Sea" as both sides tried to turn the flank. The sides eventually reached the sea and niether had been successful, the only course was to dig in. The Germans pulled back to the closest high ground and dug in, the Entente got as close as possible and also dug in. The War on the Western Front became a 450 mile siege with the continous line of trenches we are all familar with. In the winter of '14 the Division settled in the Somme district until the end of the Somme campaign and winter '16\'17. They then retreated to the newly built Hindenberg line and were involved in fighting around Arras. In the summer of '17 they fought at Passchendaele, otherwise known as Third battle of Ypres. In spring '18 they fought in Germany's last throw of the dice, the great March offensive, where Germany came close to victory, the British and Commonwealth troops were driven out of miles of their front line and the Portuguese force disintergrated in mass panic. The result being the Commonwealth and British forces had to retreat until they had their "backs to the wall". However, after several months of bitter fighting the offensive came to a halt. The Germans had fought themselves to a standstill from which they'd never recover for the duration of the War. Finally, there are a couple of photographs taken during Germany's general retreat and the last photograph entitled "home coming" is a picture of a town center with it's deserted streets, which I think says it all. As the Division was in the Somme district for a prolonged period of time it really adds interest to the photographs as we can see the towns, villages, churches and chatuexs slowly blasted to rubble brick by brick. You can see how destructive modern warfare was to the landscape at the time. One early war photograph will show a typical picturesque countryside scene and then further along the book there is a photograph of the same view taken later in the War; that picturesque scene is now like a barren lunar landscape as the weapons and detritus of War take their toll and seem to corrupt nature itself. 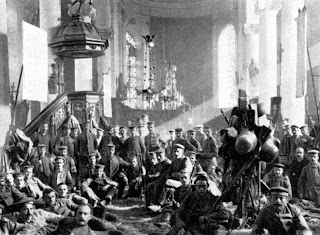 In fact there are a few cases in the book where several photographs have been taken over a period of time - of a particular church or chatuex - as if to record the slow and devatstating effect of artillery as it turns a beautiful building to rubble. The collection of 405 photographs is extremely wide ranging in subject matter and most have never been published before. Many are of the trenches and the typical you'd expect: group photos, explosions, casualties, captured weapons, POWs and arty emplacements etc. However, it also includes many interesting ones of work behind the lines. Photographs of charcoal collectors, butchers, bakery, setting up weather balloons, troops using a threshing machine, bottling soda water and other normally unseen logistical work. One photograph really stands out from any other photo from WWI I've seen. 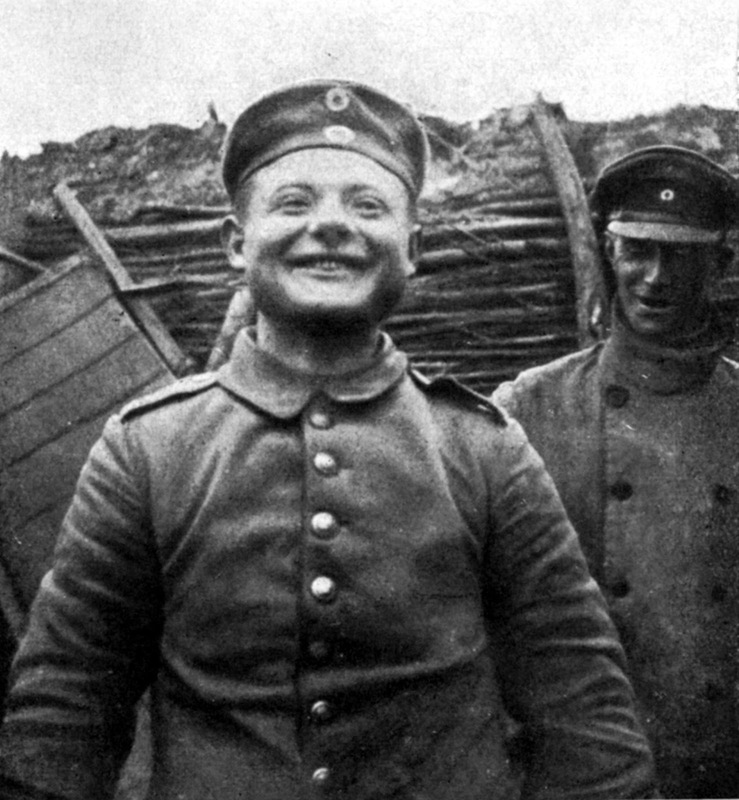 It's a picture of a young German soldier 14th Kompanie RIR 99 who has an open, innocent face with a massive smile that seems to go from ear to ear! His Company Commander is standing just to one side behind him showing, what seems to be a fatherly look that could say "daft sod". 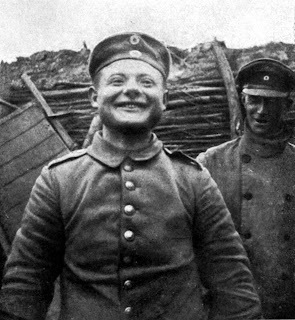 He looks so young, innocent and happy, which makes it so poignant as I know he is only weeks away from the horror that was the Somme offensive and I wonder if he survived the attack and even the War, I hope so. There are also some photographs of downed planes, and it would be interesting to do some research to see if you can indentify the squadron and if possible the pilots name. In one photograph the RFC pilot is standing next to his crashed plane and another photograph has a German pilot standing next to the wreckage of one of his kills. The book is divided into three chapters. The first chapter covers the start of the War to Dec '16. The chapter starts with a brief summary of each of the actions the division fought in during that period. The next chapter carries on from the last until the end of the War. Again, at the start of the chapter are brief summaries of the actions the division was in for that period of time. Next are three large scale maps of the areas the division was in. The final chapter is a list of dates and names of all the battles the Division was in and finally the figure of killed, wounded and missing Officers. You are also given another total for NCO's and other ranks that the division suffered during the War. The book is 174 pages and 405 photographs. I'd have paid more if the paper used had been photograph paper and been colourised as I think that would have added another level to the book. Still, I recommend it if your looking for an interesting and extensive photograph collection following a particular unit. It's a great companion book to Jack Sheldon's German Army on the Somme or Ralph Whitehead's Otherside of the Wire. You can purchase Against the Tommies directly from Pen & Sword or from Amazon and any other large book store. Hardback edition retails at £19.99.